Disney’s Hollywood Studios is often targeted as the site of the “next big thing.” If you follow the rumor mills, you’ll know that there is a pretty big one buzzing out there. 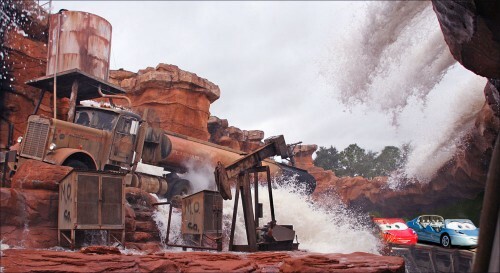 This entry was posted in Disney Theme Park News and Rumors and tagged Carsland, Catastrophe Canyon. Bookmark the permalink. I could live with Catastrophe Canyon going Cars. It feels half done anyway- why not theme it up more. Hilarious. I love you Parkeology. I hope my future wife has your wit. I hate to say this as much as the next person, but Cars Land is really helping to validate DCA. 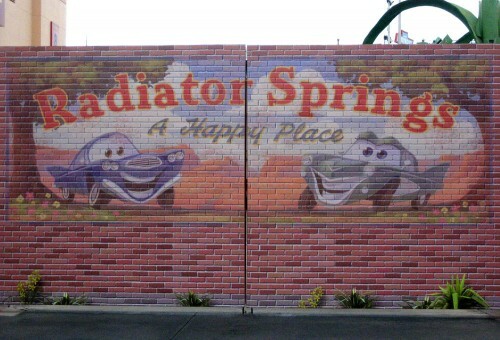 Getting a duplicate of Radiator Springs Racers at DHS would be a slap in the face. I pray that it does not happen. I would however be all for a Cars themed experience at DHS, just not a duplicate. Thanks Joshua! We love you too! I also am not in love with Carsland coming to DHS, because it takes away the uniqueness of DCA. But similarly, I’m not going to complain about the Studios getting more rides, rather than yet another stage show. I’m reluctant to believe the rumors for one reason: if they were even toying with the idea of duplicating Carsland, I think they would have been ordering duplicates of everything the way they did with the Little Mermaid rides. Wouldn;t that have been the cheaper way to do it? I have a tough time imagining doing them doing something the expensive way when they could have done it the cheaper way. I can easily believe that Kathy Mangum has been transferred to oversee something that would be to DHS what Carsland is to DCA. But I’m still skeptical that it’s a duplicate. They KNOW little girls like Ariel, so in their mind, it’s a slam dunk to order duplicates. I’m not sure they realized that Carsland would be such a hit. The funny thing about Disney is that they tend to not realize what it is people love. They assume it’s the character greeting and the vinylmations and the Jon Benet Ramsey look-alike boutiques. Oh and “interactive build-your-own-car-and-slap-your-face-on-it” displays. But all that stuff is window dressing. In the end, people just like awe-inspiring stories that put them in the middle of the action. Who would have guessed? I thought the whole point of Cars Land was to bring something unique to DCA and help prop it up as a destination park. As much as I would like to see it in Florida, come up with something unique instead… and fast. Sounds like James Cameron is already flaking on Avatar. Brilliant post — hilarious and scary! Fantastic post. I laughed so hard at the end. 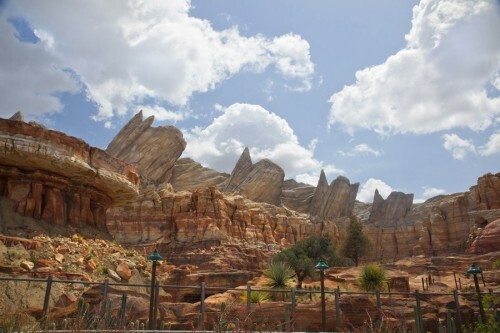 But… would including Catastrophe Canyon as a new show scene be so bad? I could actually see that being really cool. As long as it doesn’t replace a single moment of the original ride. Although, now that I think about it… the entire DHS version will probably just be your ride vehicle moving slowly through a defunct (money, money, money!) Catastrophe Canyon while the magical RFID touch screen on your dashboard tells you how pretty what you’re looking at (“Radiator Springs”) is. Having not yet ridden Radiator Springs Racers (I’m going this winter), I don’t know if it would be bad or not. To me, Catastrophe Canyon represents the bad side of DHS. Which is to say, it is blatantly ripping off Earthquake at Universal. Great post. Now I am getting extra excited. I have to say though that the signs are pointing to a better tomorrow. From what I have read as good evidence of this being true are: 1 the main person who worked on the original radiator springs has moved to Orlando, they want to get rid of the stunt show. Everyone keep their fingers crossed!!! That would be the TDO way, no doubt. The sad thing is the fact that I wouldn’t mind that scene being incorporated. That could be the best article I’ve ever read on the mouse. The shortest, most honest blog entry I’ve read here yet.